McClain’s Reece Schluep attempts to block Hillsboro’s Ethan Snapp from getting the ball along the sideline on Thursday at McClain High School where the Tigers took on the Indians FAC boys soccer action. McClain’s Kelli Uhrig and Hillsboro’s Sami Blair battle for possession of the ball Thursday at McClain High School where the Lady Tigers hosted the Lady Indians in a FAC girls soccer matchup. 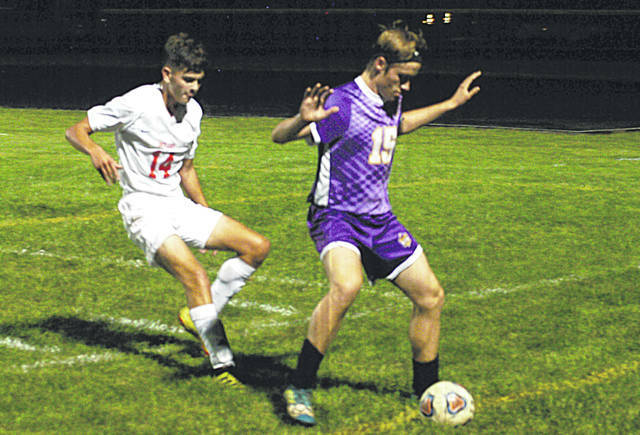 GREENFIELD – The McClain boys and girls soccer teams hosted Hillsboro on Thursday at McClain High School; the Lady Indians took the first match as they beat the Lady Tigers 10-2 and the Tigers beat the Indians in the boys matchup by a score of 5-1. 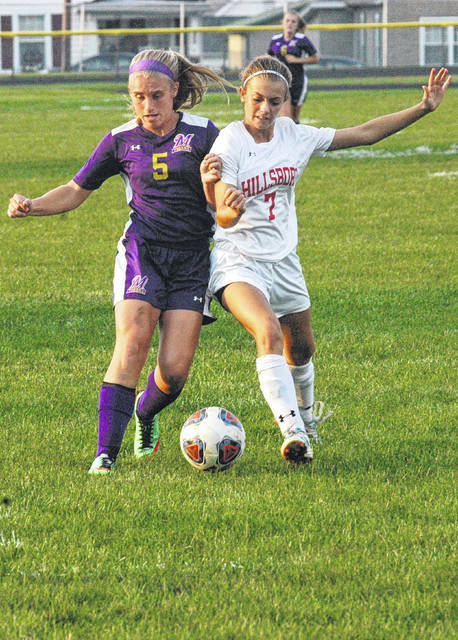 Hillsboro’s Lady Indians came into the cross county and Frontier Athletic Conference rivalry match firing on all cylinders and they scored six goals in the first half. The first goal for Hillsboro came just over two minutes into the game when senior Molly McCreary assisted on the Sami Blair goal. McCreary got a goal of her own a short time later off of an assist from Emily Hawk that gave the Lady Indians a 2-0 lead less than eight minuted into the first half of play. Callan Myers got in on the goal scoring action thirteen minutes in when she scored unassisted to push the Hillsboro lead to 3-0. McCreary and Myers kept pushing the issue for the Lady Indians and McClain had no answer as Myers registered her second goal of the game off an assist from McCreary and the Lady Indians were in control with a 4-0 lead. Hillsboro freshman Laila Zugg netted the fifth goal of the game for the Lady Indians, with 11 minuted to play, off of an assist from Myers. The sixth and final goal of the first half for Hillsboro came off the foot of Stephanie Patton with just over thirty seconds to play before halftime. The Lady Tigers added a goal of their own as Kelli Uhrig netted one to send the game to halftime with the score 6-1 in favor of Hillsboro. The Lady Tigers defense was much improved at the start of the second half as they held Hillsboro out of the net for the first 20 minutes after halftime. Then with 17 minutes to go in the game Brynn Bledsoe assisted on Patton’s second goal of the night and the Lady Indians were rolling again. Myers picked up her second assist when she found Paige Howland for Hillsboro’s eighth goal of the game; then Howland connected on another goal off an assist from Blair for the ninth. Hawk got her second goal of the night with 20 seconds to play and Myers picked up her third assist for Hillsboro’s tenth and final goal of the game. Kerigan Pollard had the second goal of the night for the Lady Tigers to provide the 10-2 final score. In the boys game Hillsboro was the first to strike as Andrew Gunderman scored off of an assist by Ethan Snapp to give Hillsboro a 1-0 lead. The host Tigers answered a short time later when Luke Sanchez netted a goal to tie it at one and from there it was all Tigers as Caleb Goddard gave McClain the lead with the second goal of the night for the Tigers. Reece Schluep added McClain’s third goal of the half and netted a second early in the second half to push the McClain lead to 4-1. Goddard added the fifth goal of the night for the Tigers late in the second half and Hillsboro was kept out of goal over the final 40 minutes of play to provide the 5-1 final.